During the events of the Planemeld in 2E 582, she aided the Soulless One in unmasking the true intentions of the Maulborn, who posed as a philanthropic group working to combat the deadly Llodos Plague, as the ones spreading the disease in the first place, in order to raise an army of plague husks. She subsequently became involved in helping keep the peace at Fort Amol and protecting the Skald King. Sometime before the end of the Planemeld, Naryu uncovered a plot within the Morag Tong, which if achieved, would transform the Tong into more than a mere league of assassins, it would make them powerful enough to allow them to replace the heads of state that were once able to force them to go into hiding. It was known as the Simulacrum Rubric, named after one of the items they sought to obtain, Sotha Sil's Simulacrum Rubric. It was orchestrated by seven influential members of the Tong who called themselves the Seven Secretives. The plan involved a coordinated coup to take over the Tong, which Naryu would not allow happen. Naryu sought an audience with the Tribunal god Vivec, to be granted a Tribunal sanction for extrajudicial execution for her superior, the grandmaster of the Morag Tong, Rythe Verano. She had discovered that he was involved with the Secretive's plot, and had ordered writs of execution for them to throw her off his trail. Vivec granted her request and provided with her an ally, a warden by the name of Boldekh, who wanted to bring Verano to justice for his involvement in the death of his partner. They tracked him to Sadrith Mora, where they spotted a Telvanni mage teleporting him to the Clockwork City and him vanishing along with the portal. They convinced the mage to give them passage to the Clockwork City, and once there, they tracked Verano into a mechanist's workshop where he obtained one of the items needed, Sotha Sil's Simulacrum Rubric. He spotted them, panicked, and summoned a portal back to Vvardenfell. Naryu and Boldekh followed him through it and emerged in Mudan Ruins. Argonian guards were waiting for him there but fled when an army of Dwemer Animunculi appeared out of the ruin. A Dwarven colossus appeared out of the ruin, blasting it apart and immolating Verano along with the satchel that held Sotha Sil's Simulacrum Rubric. With the combined efforts of Naryu and Boldekh, they destroyed the colossus. Naryu severed the grandmaster's head and took his skull as a trophy to take with her as she sought out to carry out the writs of execution on the other traitors. Naryu would slowly piece together the other parts of the plan as she sought to execute the Seven Secretes. The first target was a Dunmer by the name of Vonos Bero. He was looking for a clockwork device of importance. It was stolen from the Clockwork City, and it was taken to the Dwemer ruin of Bthuand within the island of Vvardenfell, where Clockwork Apostles were slain after attempting to retrieve it. The device was shattered when Vonos, got into an argument with the smuggler that led into a brawl, and the device was shattered as a result. Vonos was then slain. 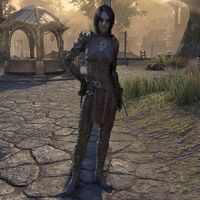 The second target was Odral Quintayn, who was in Craglorn looking for an Alchemical secret that consists of combining forbidden reagents with stolen Celestial power, the result is the creation of monsters said to be able to revert Tamriel to the chaos of the Dawn Era. Naryu tracked him down and killed him before he was able to drink the potion. She then smashed it. The third target was Vuldronu Oth, who was located in the daedra occupied Imperial City. Her contribution was to learn the secrets of daedric summoning. Naryu located him in Imperial Throne Room, studying ancient tomes while disguised as a dremora, and slew her. Her fourth target was Rels Llothri, who fled to Wrothgar. His contribution was eight scrolls for summoning pariah scamps, which when consumed, makes mortals unnoticeable. She tracked him down to the Trinimac fanatic's site of Paragon's Remembrance and killed him, and consumed a scamp to escape the fanatics who were alerted to her presence. Her fifth target was Myvryna Llothri, Rels Llothri's wife. She was looking for the artifact, the Helm of Oreyn Bearclaw, which grants the wearer divine dexterity and enhanced endurance. She would make friends with the Bosmer, Gadnuth Oreyn, who came to reclaim the relic from the orcs. She tracked Myvryna to the Malacath holy site Bloody Knoll, in the temple called the Sanctum of Prowess. Myvryna had beaten Naryu to the relic and would have overpowered her, but she outwitted her. She then gave it over for safekeeping to Gadnuth Oreyn. Her sixth target was the grandmaster's daughter, Tlera Verano, who was looking for the artifact known as the Aurbical Abacus. An ancient Redguard relic that could not only predict the weather but actually influence it on a continental scale. She tracked her down to the old Hubalajad family tomb known as Bahraha's Gloom, and put on an ancient Zeht Priestess regalia as a disguise. Tlara planted a trap on Naryu and waited for her to touch the tomb's coffin, and she awakened the tomb's guardian, a Mournful Aegis. The plan backfired, as the regalia allowed Naryu to go unharmed, and the Aegis rent Tlara, killing her. Within the coffin found the Aurbical Abacus and smashed it to pieces. Her seventh target was Dathus Ildram, located in the Gold Coast. He set out to spread the Tong's influence across the entire continent by forming an alliance with the rival assassins guild, the Dark Brotherhood, and if unsuccessful, by a hostile takeover. She had tracked him down to Kvatch, where she met the Soulless one, who had joined the Brotherhood. She convinced them to aid her in carrying out the assassination so that the Brotherhood wouldn't track her down and murder her for crossing into their territory. She was successful in murdering him, and the soulless one was to take credit, but it was a body double. Naryu trailed her ally to the Brotherhood's sanctuary, where she slipped in, and was stopped by their Speaker. He revealed that he meant no harm, and that Dathus left to attempt to recruit the Order of the Hour at their Hourglass Enclave after he was rejected by the Brotherhood. He was evidently successful, as his newfound allies defended him when Naryu tracked him down to the old Imperial ruin known as Knightsgraves. In the end he attempted to negotiate, but it was futile as Naryu completed her last writ of execution, severing the dream of the Simulacrum Rubric, and bringing honor back to the Morag Tong with the deaths of the Seven Secretives. Naryu remained in the Gold Coast for some time after killing the last Secretives, and subsequently became a target along with three others in a prophecy that predicts that they would cause ruin, and the group known as the Fate-bearers would try to stop it. They sought to murder an Imperial member of the Gold Coast Trading Company who was said to cause economic collapse, a baker involved in the death of a prominent leader, and an Eye of the Queen involved in the betrayal of a queen. Naryu was the fourth who was the worst prediction: she or her daughter would cause the world to burn. The killer, who earned the name the Sweetroll Killer due to her warnings contained within sweetrolls, was stopped by the Soulless One, the Khajiit Razum-dar, and Naryu, who tracked her down to the farm. The details surrounding the events are vague. Accounts conflict on the number of targets the killer was successful in assassinating, and some even claim that all survived. The fate of the Killer herself remains a mystery as well. Some say she was spared in exchange for sparing the survivors, others say she was killed to stop her from trying it again. She met with the Soulless One back at the end, where she let them know that she would be returning to Vvardenfell. Naryu reunited with the Soulless One in Vvardenfell, where they became entangled in the politics revolving around House Redoran. They would discover a plot surrounding the murder of Ulran Releth, the brother of Naryu's apprentice, Veya Releth. Ulran was the son of a House Councilor, and he was stripped of his rank and exiled. He was ultimately killed by Khajiit mercenaries, and upon learning their involvement with Balmora's guard captain, Brivan, Veya sought to murder him. She is featured in the cinematic Morrowind chapter announcement trailer. The experience was later described from her point of view in her Journal. This page was last modified on 14 March 2019, at 01:54.